So you want better habits? As you well should. Your habits are the defining factor in the life that you create and perpetuate. They determine what you eat, where you go, how you move and how you feel. They shape your reality. Oftentimes people get so caught up in negative behaviors that they overthink how simple it actually is to change a habit. No, not easy, but yes, simple. According to Charles Duhigg, author of The Power of Habit, we each follow a feedback loop of cue, behavior, reward. Repeat. 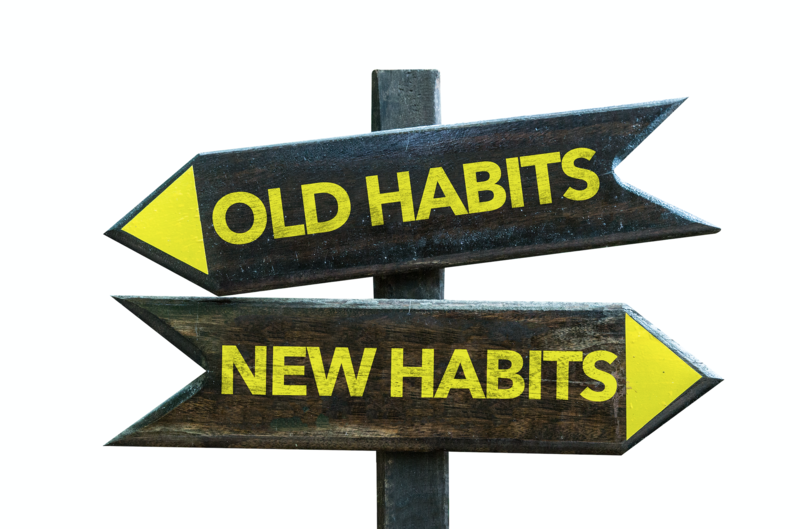 Taking on new habits by giving yourself new cues and rewarding different behaviors will help interrupt old habits. It will reshape your choices and responses. Remember, this is a process. You are quite literally rewiring the circuitry of your brain. So it’s probably not going to feel like second nature on the first day. But you can expedite this process of making self-care exercise a habit. The good news about habit-building is that once you’ve hard-wired a new habit, it becomes automatic–so you don’t have to put so much effort in anymore. To turbo-charge into newer, healthier habits, consider changing a keystone habit. A keystone habit is a shift in behavior that leads to “chain reactions that help other good habits take hold,” according to Duhigg. Adopting a new keystone habit will create a cascade of positive effects on the rest of your life. For instance, if you’ve been sleep-deprived for months and you suddenly commit to getting eight hours a night, that’s going to positively impact many other parts of your life: You might drink less caffeine, make better eating choices, be more productive at work. The special magic of keystone habits is that they change your self-concept. When your idea of who you are changes, you experience a paradigm shift. You come to think of yourself as a different kind of person and see your life through new eyes. Then you begin to behave as that kind of person would. If you want to make health and fitness top priority, we suggest that you make self-care a keystone habit. By regularly setting aside 10, 15 or 20 minutes to relieve tension, breathe deeply, tune in to yourself more fully, all other decisions will be touched. Regular self-care practice will help you think of yourself as someone worthy of care–someone who deserves to reach and actualize your bigger hopes and dreams. It will help you out of the frustrating reactionary cycle of stress and poor choices in your daily life. Why do I need self-care fitness? Committing to a regular self-care practice means you set aside time to do activities that make you feel peaceful, vibrant, fulfilled and cared for. This helps inspire regeneration in your body. You become a more resilient self-healing, self-repairing organism. Examples of self-care: Practice self-massage by rolling on therapy balls. Do gentle yoga postures to ease tension and increase circulation. Experiment with conscious breathing practices. Meditate on a new mindset. Engage in dynamic stretch and movement that feels good. A committed habit of self-care will nourish your body and mind to set your attitude and nervous system up for optimal health. If you want us here at @TuneUpFitness to be your first accountability buddy, tell us your self-care goal in the comments below! Let us know why you know you knead it (sorry, self-massage joke), and what your plan is… we’ve got your back. I will definitely use these five steps in helping me to take more time for self-care practices. Adding a new keystone habit every month is a small step to make big changes! We are worthy of our own care and commitment!! One of my Sankullas is:I will take care of my body, by giving me proper self care daily to bring me health and wellness. Thanks for the idea of blocking time on my calendar for self-care- i do it for the dentist and doctor, I even do it for my car.. time to value practice enough to make an appointment with myself! Great tips for self-care. I especially like the suggestion about putting it on the calendar. Wow. That’s exactly what i needed! I started to learn about neuroscience, about how habits are being created, how difficult it is to create new positive habits and this article is right on point! I love 5 steps to make self-care fitness a habit. Will try to integrate it into my daily life. Thank you! Great tips. Thanks for this. Knowing we are deserving of healthy habits is something I had not even considered! this is a very important article because we often push our bodies with activities but in the long run, would benefit from taking a step back and making sure that muscles are loosened and nagging pains are addressed. it’s being mindful about our wellness. I have an obstructive lung disease that causes inflammation of the bronchi called bronchiectasis. I really want to develop a rolling regimen that will help with this. Any suggestions? I’m a medical provider, so don’t worry about overstepping your bounds. I have a pulmonologist. I’m also in Jill’s YTU in LA. There is magic here. Thank you for the article. I think that in order to practice self care you must make sure that you embody your body. Accept it for all that it is and then better it by implementing the methods outlined in the article. I love the idea of targeting a keystone habit. It makes the daunting work of attacking a list of bad habits more manageable. If I change one thing I can trust the other things will follow. Even if they don’t, I have the positive reinforcement that I could change one thing, so now I can tackle another. Self care is the new black.. thank you for this helpful article and inspirational too! Which is how we can find momentum to create healthy habits and the focus of what self care actually looks like – which can be discipline masked as many things.The biggest factor for me has been to actually schedule things into my calendar.. thanks to technology we actually have lots of free accountability right at our fingertips. I’m focusing each day, through meditation, on being positive, non judgmental and accepting life as it is presented. This stops the pushing away and encourages the joy of every day.